The perfect table to stand between your Patio Bar Chairs, our Bradley Outdoor Patio Wood Bar Table in White will offer a convenient place for your drinks, snacks or a casual meal outdoors. Made from 100% Acacia Hardwood that is native to Australia and Asia, and used in the construction to make excellent and high quality furniture that resists mold, mildew, fungi, termites, rot, and decay. Comes in beautiful White Painted Finish, this set will bring your outdoor patio a classic charming look, sounds perfect! The PEX-263-T bar height outdoor table from CorLiving welcomes back the days of Mission design, popularized in the Southwest during the early 20th century. The contemporary approach to this classic aesthetic is what sets this stylish outdoor table apart. From the clean lines to the emphasis on showcasing the wood grain. Treated to withstand the elements, this hardwood table is also umbrella compatible. Accent any backyard garden or patio perfectly with the Gronomics High Top Table. The table comfortably accommodates six chairs and is the perfect setting for dinner or entertaining outdoors. The table has a pre-drilled hole for an optional umbrella. (Umbrella stand and matching bar stools sold separately). Vista Lane 3-Piece Aluminum Wood look Bar Set by Woodard is perfect for your pool, deck or patio. Strong and durable all aluminum frames will protect your set from rusting. Bar table features convenient shelves and 2 woven drawers to hold food and drinks. Complete with 2 bar height chairs with plush UV protected all-weather Olefin cushions. The Swedish-designed self-storing Stockholm Balcony Table from INTERBUILD folds flat and will fit all railings because it is width adjustable. It's Ideal for small spaces such as balconies. Made from beautiful acacia hardwood, the Balcony Table has a golden teak hard wax oil finish. The acacia wood is Forest Stewardship Council (FSC certified) from sustainable forest resources. The Balcony Table has a hinged table surface 18 inch x 24 inch. Bradley Outdoor Patio Wood Bar Table in White The perfect table to stand between your Patio Bar Chairs, our Bradley Outdoor Patio Wood Bar Table in White will offer a convenient place for your drinks, snacks or a casual meal outdoors. Made from 100% Acacia Hardwood that is native to Australia and Asia, and used in the construction to make excellent and high quality furniture that resists mold, mildew, fungi, termites, rot, and decay. Comes in beautiful White Painted Finish, this set will bring your outdoor patio a classic charming look, sounds perfect! 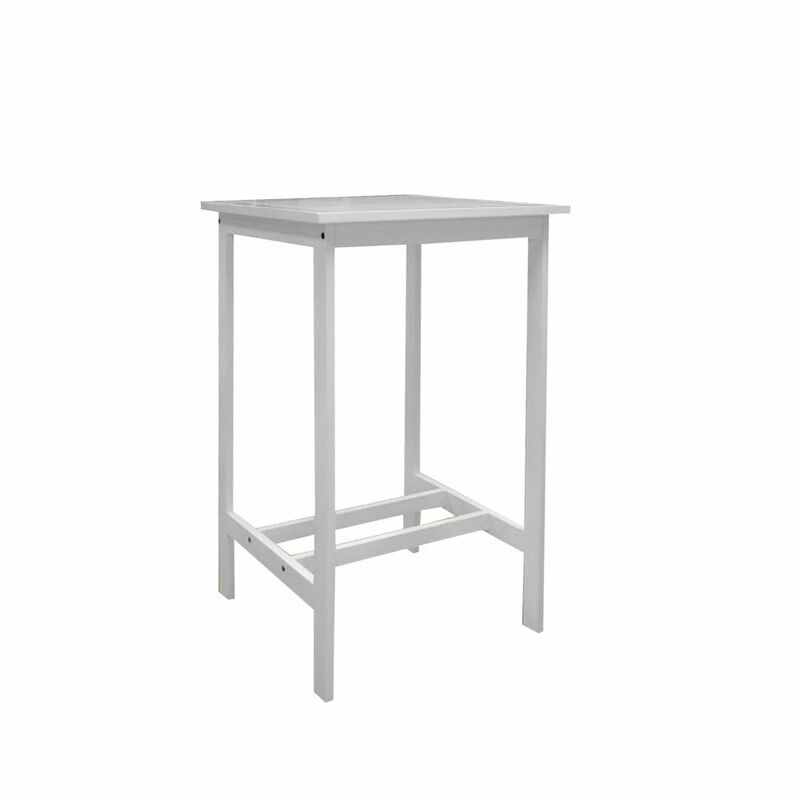 Bradley Outdoor Patio Wood Bar Table in White is rated 3.0 out of 5 by 1. Rated 3 out of 5 by lovemylake from Helps me enjoy my view but The top has cracked and split at each joint area after only ONE week of use by two adults. Plus the top accumulates and holds rain water. Bottom line is that I am concerned about longevity of this item.